A modern and elegant diamond choker necklace by Chopard. Round brilliant black and white diamonds, set in 18kt white gold, form an alternating checkerboard pattern on the center component. 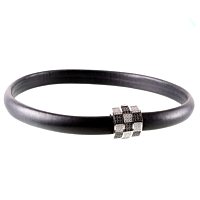 The soft edged black leather choker is connected by a hidden closure within the checkerboard piece.